Infront Sports & Media, media and marketing partner of the European Handball Federation (EHF) for the EHF EURO, and SPORT1 have signed an exclusive contract for the media rights of the men’s tournament in 2014. 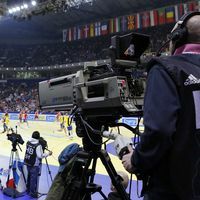 The German sports channel is to broadcast at least 22 games of the upcoming EHF EURO live on free TV - including the semi-finals and the final. The Men’s EHF EURO 2014 will be held in Denmark (Aalborg, Aarhus, Herning and Copenhagen) from 12 to 26 January. Besides the exclusive coverage, SPORT1 will also broadcast through its online platform SPORT1.de via live stream as well as through the SPORT1 app. This will be complemented with a full range of news, background material and commentary across the SPORT1 news formats and the digital sports radio SPORT1.fm as well as again SPORT1.de and the SPORT1 app. Olaf Schroeder, SPORT1 Managing Director, said: "2014 will showcase a series of superb sports events. SPORT1 will begin the sporting year with the Men's European Handball Championships as the first great highlight! "After the 2013 IHF Women's World Championships, which we broadcast on free TV until 22 December, as the number one sports channel, we will then provide fans the next high-level event – all on top of our live broadcasts from the German Handball-Bundesliga." Stephan Herth, Executive Director Summer Sports of Infront Sports & Media, added: "Handball is the most popular indoor sports in Germany. With its long tradition and strong national league, the country is one of the most important handball markets in the world. "Thanks to the partnership with SPORT1 for the EHF EURO, we are guaranteeing the fans extensive free TV coverage of this major handball event."